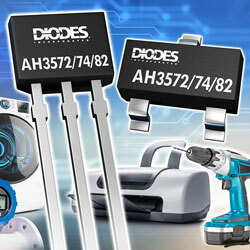 Diodes Incorporated has launched its AH35xx series of omnipolar Hall effect switches. These devices highlight a wide operating voltage range of 3V to 28V, allowing them to support all of the 3.3V, 5V, 12V, and 24V rails commonly found in office, industrial, and home appliance applications. Typical applications include position and proximity sensing, level detection, open and close detection, and flow metering. All of the devices in the series comprise input supply reverse polarity and overvoltage protection, with 6kV HBM ESD rating as well as output overvoltage and overcurrent protection. The series comprises three devices with a selection of two magnetic switching threshold configurations; operation points are either ±40 or ±20 gauss, while release points are ±10 or ±25 gauss, respectively. All devices offer high threshold stability and low-temperature drift. The AH3572 and AH3574 offer an active-low, open-drain output, while the AH3582 gives an active-low, internal resistive pullup output, which can lessen component count and overall solution size.